Ok, to quickly get you up to speed. 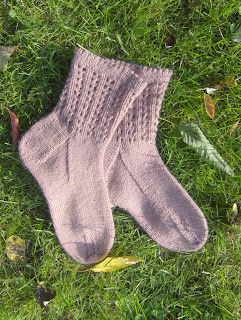 In 2006 I started a pair of Simply Lovely Lace Socks by Karen Baumer from Interweave Knits Spring 2006 in Opal Uni yarn. 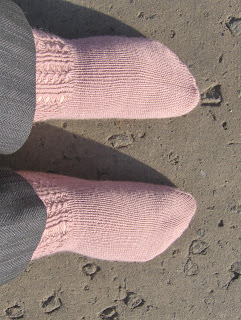 I knitted two at once on lots of dpns until the cuff was as long as I wanted for ankle socks, then laid them to the one side for a-a-a-ages, having fallen out of love with socks again, and not having enjoyed knitting into the back of every knit stitch. In summer 2007 I decided to give them a new lease of life and made them into fingerless gloves for myself, which actually involved quite a lot of knitting the lace pattern I hadn't enjoyed, and a lot of fudging and making it happen, but I was very happy with the results. Now fast forward to summer 2008 when during a sock binge I realised that I hadn't actually ever worn my fingerless gloves for real, only in poses for blog posts/ Flickr. So I fished them out, frogged the handy and thumby bit of the glove, rolled that crazy, tangly stuff and put it aside and did what I should've done in the first place, which was knit on the rest of the sock in stocking stitch. Dunno why that option didn't occur to me last year, maybe just because I was so out of the sock knitting mentality. Fortunately I had plenty of the Opal Uni left. I am delighted with the results, and they will get much more wear out of these sockazitos than from a pair of opera gloves. Here are a few photos for your perusal. Two things to look out for are 1) Look at all of the autumn leaves starting to hit the grass and 2) Look at my sausagey feet in the second-last photo. It was taken at a weird angle, but my feet and ankles are very sausagey in real life as well, I must confess. Lovely lace and lovely yarn - the socks previously known as fingerless glovess! Worth waiting! Plus you have matching duo! Just imagine what would matching hat do - something even more amazing!